Welcome back to the second instalment of my close look at the whole Catch Up® Numeracy process, and the 4 stages that form it. Some thoughts today, then, on Stages 2 and 3. Again, I would like you to keep in mind throughout, the cyclic motion of the process – that once within the process, Stage 4 feeds directly into Stage 1 which then feeds into Stage 2 and so on. Ensure that all the assessments for learning are completed. You must resist any temptation to begin the individual sessions based on just some of the components. Keep within the learner’s identified target level. It is important that a balance of the components is maintained. Be aware of the topics being covered in a learner’s class teaching. Take advantage if any planned content in a maths lesson matches components in Catch Up® Numeracy, within the learner’s current target. If a learner has one or two Catch Up® Numeracy sessions on a topic before it is covered in class, this could then result in the learner’s improved access to that topic. There can be no recommended number of sessions which will guarantee understanding. Recognise, however, that sometimes a learner may need time for a concept to be assimilated, and giving them a break by moving onto a different component/subcomponent – without having updated the learner profile – may be of benefit. Remember that maths teaching in class will support your Catch Up® work, so do not feel that if you do this, you are ‘abandoning’ the component. You will come back to it. Ideally, two sessions per learner should be timetabled each week, spaced as evenly as the timetable will allow. Timetabling the sessions always works best, as this means they are less likely to be cancelled. However, keep in mind which lessons are being affected and ensure there is a rotation of missed subjects. Also consider the learner’s interests. Missing their favourite lesson, which might also provide them with most success, could set up barriers, particularly for older learners. Using a timer will help ensure that the balance of timings for the three parts (3, 6 and 6 minutes) is more accurately adhered to. The Catch Up® Numeracy sessions follow a highly successful format, in which understanding is developed first via a practical/visual model, supported by appropriate discussion. Only then is the Mathematics translated into a written format. There is no one model for the review and introduction. There will be a difference between a review and introduction which moves onto a different component and one which continues with the same component. It is valuable, in the review and introduction, to check what the learner has remembered from the previous session, but you may need to gently prompt them as your learner may well have memory issues. Beware of falling into the trap of questioning too deeply and then feeling forced into using the session to re-teach the previous numeracy activity, rather than what you had planned. Remember, the Catch Up® Numeracy process ensures that all components are revisited. The numeracy activity is where you will develop the learner’s understanding of the Mathematics. It should be a practical activity (which will provide a visual model of the concept), using a learning style appropriate to the age of the learner, the component and the number range. Ensure you talk through your thinking as you model – this will support development of the learner’s Mathematical reasoning. This applies equally to older learners in KS3. Encourage your learner to talk through their thinking as they complete the activity. Young learners do not find this easy and you will need to support them by sympathetic questioning and the use of pause, prompt and praise. They will do this more voluntarily if ‘them explaining’ becomes an expectation every session. It is important that learners are able to record their Mathematics, so the linked recording element is essential. 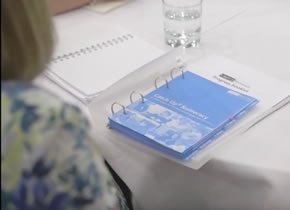 Ensure that your linked recording does repeat what the learner has done in the numeracy activity, as learners need to make connections between the practical (visual) representation and the written representation. The yardstick that the recording should be “understood by others” is very valuable. If the purpose of the recording cannot be identified and understood by others, you need to question if your learner could understand it at the time. Insist on all numbers and symbols being accurately formed. You need to encourage good habits. Your linked recording activity needs to reinforce the calculations policy of the school. Your input can make a significant difference for those methods your learner is finding difficult. As you model, support it with a clear explanation of the reasoning behind it. I hope these points will help you with your delivery. Always remember, however, that your Catch Up® Numeracy file will provide valuable support and should be your first point of reference. Next time, I will focus on the next stage in the process, the ‘ongoing monitoring’, and will include within this thoughts on the comments and follow up sections.